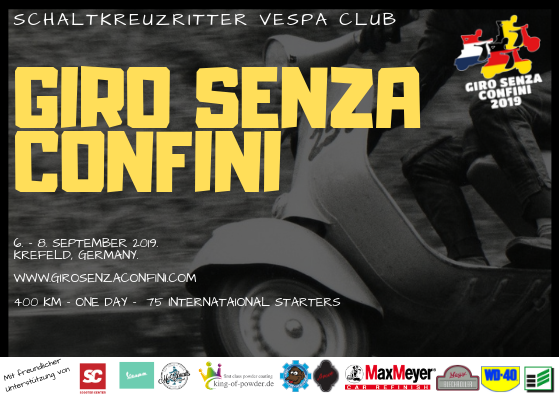 We want to invite you to out rally “Giro senza Confini” which is going to be next September. We are going to ride from Krefeld through the beautiful Rhineland to neighboring countries and along the river Maas via Straelen back to Krefeld. Our riders will cover a total distance of approximately 400km – on one single day! The “Giro senza Confini” is a rally for the drivers of all Vespas, including 1950s Faro Basso to the current GTS. There are no restrictions to the engines, however, it will be difficult to make it wit 50cc. There will be three classes: scooters up to 58 (classic/wideframe),one for hand-shifted Vespas from 58 including PX and another for automatic scooters(Et and GTS). We mangaged to find great sponsors who cooperate with us and donated very nice prices for our winners. On our event site you can also sleep with a camper. There are toilets and showers available.